My husband left for Salt Lake City, Utah for a four-day conference last Tuesday, April 22. A trip to China last summer and a conference to Hawaii in January preceded his latest adventure. Well, my boys noticed a pattern. Their dad brought them home at least three or four souvenirs a piece from both trips. I received gifts too. The occasions of his returns seemed like Christmas! On the day that my husband was to return from his Utah trip, both boys started talking about the gifts they would receive. (Yes, I guess they are a bit spoiled!). However, their dad wasn't due home until 12:30 a.m.--way past their 9-9:30 p.m. bedtime. We went through the bedtime routine as usual and I went back downstairs to create and print out programs for the Tribute Walk that was to occur the next afternoon. I had been in the middle of a painting job on my oldest son's room so that my husband wouldn't have to deal with the chaos that surrounds such work. He's not a big fan of new paint jobs. Transforming a room from blueberry blue to rice paper white (as requested by my son), has been no easy task. Is it needless to say that my boys that couldn't settle down? I tried my best to get them to go to sleep, but I needed to focus on my work as much as possible. All I can say was thank goodness the next day was Sunday. We didn't have to worry about getting up for school! What happened when their dad returned just after 12:30 a.m.? My husband and his boss (who drove him home) were greeted by two giggling, happy boys in pajamas. They actually ran out to the car! The oldest gave him a welcome home card. The boys received t-shirts with Utah logos (as did I), and three other gifts that suited their personalities. My youngest received a wooden animal and Native American set, a small box of shiny rocks and a small stuffed bear. My oldest received a wooden frog pen, a small stuffed frog and a paper back children's book. I received a Deer Christmas Ornament from Antelope Island (in the middle of the Great Salt Lake) and I believe my teal t-shirt was from the island as well. Yes, the boys slept in the next morning. I was out of the door to chalk out the directions for the memorial walk by 8:30 a.m., but my husband said they didn't get up until 10:30 a.m. My little night owls definitely did not transform into early birds the next morning. I suppose that was a blessing. Smiles--jml. Autism Awareness Month is coming to an end. It's a bit of a relief to this blogger who helped plan and implement some of the nine events my group, Central Michigan Autism Society of America (pending chapter) planned. Our Grand Finale was our memorial walk which turned out to be the beautiful, successful event for which the co-chairs had hoped. The family, who was a bit nervous about the whole event, was most appreciative afterward. I think we are all a bit pleased, but relieved it is over. The awareness committee's efforts to bring awareness to the community was successful. We had good to great attendance for our events. Local papers covered most of our activities. A special thanks goes out to reporter Frank E. and Central Michigan University's student newspaper, CM Life. Two of us moms were awarded for our autism-related efforts by a local radio station and/or United Way. One of our mom's won CFX (a radio station with staffed with people who have big hearts) Working Woman of the Year which was wonderful. A front page article of the winner and the nominee came out in our local paper. The mom who won nominated me for volunteer of the week and I won some gift certificates, a plaque and recognition in general. CFX and United Way sponsors the volunteer recognition program. A small article about my efforts appeared in Sunday's paper which provided a boost of confidence considering I was partly in charge of our biggest event for the month. A lot was at stake because we were remembering someone special that day. A guest column written by my co-chair was published in the same edition. She did a great job writing about the eight year old boy who died recently. I'm sure his family was touched. Both co-chairs wanted Sunday to be almost perfect and it was. Anyway, during the height of the season some of us were joking around about "anything but autism days." As a result of our joking around, some of the moms and professionals in my community are planning to visit a local spa tomorrow--fitting since it will be the last day of the month. I haven't had the time to make an appointment and do not know if I'll be able to get in as the spa may be fully booked. But I'll have to admit that spa day sounds great right now. Here are the left and right views from a bridge leading into Island Park in Mt. Pleasant, Michigan. This peaceful place was a perfect spot to hold a vigil for a little boy that died last December. The vigil consisted on tossing out donated rose and other flower petals over the rail of the bridge. The words chosen to be chalked out in white at this spot was "reflect and love." Little and big kids blew bubbles as they crossed the bridge. The turnout for the walk was wonderful. More than 150 people came out to honor the eight year who died four days before Christmas. His funeral was Christmas Eve, so this event gave many a second chance to pay their respects. The walk looped around back to the park for a total of 2.2 kilometers or 1.3 miles. It ended with poems and memories at the reception in one of the park's pavilions. The little boy we remembered today loved apples so twenty green and yellow wire baskets of were filled with Ida Reds, Golden Delicous, Gala, and Red Delicious apples. The baskets were placed in the center of each table. He also loved Twizzlers, Oreos, and Teddy Grahams, so those foods were served too along with healthy options such as veggie and fruit platters. A school inclusion group and mothers of children with autism donated the food. My thoughts: As a co-planner of this event, I was happy with the turnout and the weather. We had a beautiful crisp day with not many glitches in our plans. I'm hoping it was a memorable day for those participating. Our purpose was to honor a wonderful, beautiful little boy and to show support for his grieving family. Hopefully the goal was met. Wow, autism parents in my local community were featured in two separate news pieces in one day. The first article was on the front page of the my local paper. The second was a column by a student reporter from Central Michigan University for the CM-Life below. I knew the former was coming out, but not the latter. I was hoping to find a story on the RESD panel that occurred Wednesday at CMU and found this column applauding the efforts of those with CMASA and my son's summer arts camp instead. Both pieces made my day. My two friends were interviewed for the local paper on Monday. The article came out just this morning. These two friends of mine are the president and vice president, respectively, of the organization of which I am the secretary. The article was about their efforts to get our Autism Society of America (ASA) chapter going as well as their experiences as parents of children on the spectrum. These two wonderful mothers, myself, and some dedicated friends have overcome a recent tragedy get our local ASA chapter going. We just submitted our chapter application packet a few weeks ago and are hoping to get chapter approval from the National Autism Society of America office soon. As for column, it can be said I was not expecting it. The column was a heartwarming surprise. Below are the first four paragraphs of the student's column titled "Applaud Autism Awareness." It was written by Frank Eslinger. "There are many heroes out there doing great things in the world, but for me the real heroes are right here in our own neighborhoods.Parents of children diagnosed with Autism Spectrum Disorders, or ASDs, are true examples of patience, tolerance and love. Over the course of the month, I've attended and written stories on some of the local happenings and events for National Autism Awareness month.During these events, I've learned so many new things and met so many truly amazing people. It's been an eye-opening and inspiring experience. There I heard stories of an adventurous child climbing onto the roof of their home. I've met kids with sparkling imaginations and even one with a love for green frogs. Above all else, I've learned that no matter how life deals the cards out, nothing will make these parents love their children any less." My thoughts: We, autism parents in my community do not do the work we do for recognition. We have a passion for helping people on the spectrum and their families. We also do it out of love for our children who have Autism Spectrum Disorder. I will admit, though, it was nice to be recognized. This year I wrote a autism-related letter to the editor of my local paper as I did last year. Last year's letter was printed and my husband subsequently posted it word-for-word on his information literacy blog. I don't think my newest attempt will be printed because the content included an invitation to an event occurring today. The letter did not show up on the opinion page today. However, I'm not disappointed. I was feeling stressed on the day I emailed the letter and realize I made a few mistakes that I'm somewhat reluctant to admit to making. I mostly wrote this year's version to let the chair of tonight's event know that I support her. My husband cannot watch the boys tonight and I don't think it would be appropriate to bring them along. Thus, I will not be able to attend because all of my babysitters have plans for tonight. Also, unlike last year, our cause is expected to be covered by the paper sometime this week. I'll put the link(s) up if/when available. We may have two stories: one about my two friends (autism moms) in regards to one of them winning the CFX working woman of the year and another about a Tribute Walk that is to occur this Sunday. "I am writing on behalf of the pending chapter Central Michigan Autism Society of Autism Impairment Assessment team from the Regional Education Service District (RESD) will speak at Anspach 161. If you are interested in autism, a professional or college student who needs to know more about this complex condition, or are concerned about the development of a young child, then this would be a wonderful event for you to attend. If you cannot make it to the RESD panel but are still interested in finding out more about autism then we’d like to invite you to Jeremy’s Walk and Vigil at the South Pavilion in Island Park on Sunday, April 27, 2008, 2:30 p.m. There will be an information table staffed by a member of the Central Michigan Autism Society of America (pending chapter, CMASA) from 2-4 p.m. We’ll also be honoring the life of a beautiful eight-year-old boy that died last December. Everyone interested in attending is invited. Concluding thoughts: There are a few days of Autism Awareness Month left. I encourage you to give letter writing a try. My advice is to avoid including timely dates, proofread and let someone else look your letter over, and finally, to make sure that you are familiar with the paper's guidelines for letters to the editor. Our paper has a word limit of 300 words per letter. I suspect such limits are common for local papers. When I woke my nine year old son with autism up this morning I asked him if he knew what day it was. His answer came in the form of a sleepy, husky whisper, but I heard him. I wasn't surprised he knew as my guy has a fascination with the calendar and the special days marked on it. I'm pretty sure he learned about Earth Day at school although protecting the environment has also been one of his mom's favorite issues. We recycle and hopefully as my two boy's mature, we'll even do even more. I have my guy take down newspapers, cans, cardboard, etc. from the kitchen to the blue recycle box in the basement. His little brother, who is afraid to go down there alone, helps him sometimes. My oldest also helps to recycle at school. His class teams up with a fourth-grade class at a school to sort the school's materials for recycling. I am not sure how often they do this, but I'm glad the teachers are teaching them the importance of recycling--not just on this day, but for the whole school year. 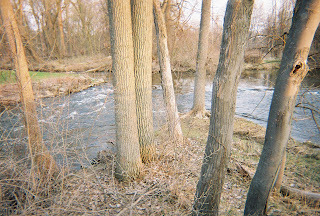 For a 2008 Earth Day Quiz for adults/teenagers go here. For a web page that lists a few earth friendly sites for kids go here. Another site lists ten ways for kids to participate in Earth Day. Some of the ways are appropriate for children with autism. Some may be a little difficult. The most inclusive activity I can think of in terms of ability levels is coloring. The many earth day pictures on this site appear in color but if you click on the letters B &W, a page to color will pop up. Today we are having wonderful, mild 70-degree weather in Michigan. My boys and I will most likely celebrate our earth's beauty by spending part of this day outside. 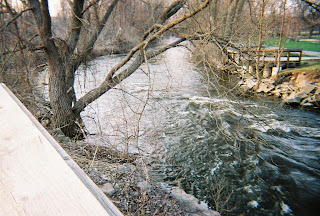 How did you celebrate Earth Day 2008? Once upon a time (five years ago to be exact) there was a mom who asked her small boy who is friends at preschool were while he was bathing. The boy couldn't answer. He looked back at her with wide. wondering eyes. The mom kept patiently asking, but the boy would just look back silently. Shortly thereafter the boy's family moved and he started at a new school. The teacher wrote small details of the boy's day in his notebook. The mom looked at them everyday and used those notes to ask her boy questions about his school day, but the boy still could not answer. Years passed and the notebooks continued from year to year. The boy started to respond to his mother's questions. Then, all of a sudden and not long ago he began to volunteer information about his day--just little details in the form of a sentence or two. He also answered her simple inquiring sentences. The latest detail he volunteered was about a school assembly. The nine-year-old began the conversation while walking back home from school with his mom. "There was an assembly today," he said, eyes shining. "What was the assembly about?" she asked. "Well it was about bucket fillers and bucket dippers. Bucket fillers are nice and kind and bucket dippers are mean. I'm a bucket filler!" "That's great," she responded. But, alas, the pair had another companion in the form of a fiery, five-year-old boy, the other boy's little brother. "No you are a bucket dipper!" "No I'm a bucket filler," came the almost whiny response. "No you aren't. I'm a bucket filler and you are the bucket dipper!" responder the little antagonizer. "[Little brother] you're the one being the bucket dipper right now," she said trying to intervene. "Stop it right now or you are going to bed when we get home!!" The other day I noticed that one of my son's teachers was wearing a purple ribbon. I wondered what it meant, but didn't have the chance to ask her during that chaotic time of picking up my five year old from school. So I looked it up and found a purple ribbon symbolizes: pancreatic cancer, testicular cancer, thyroid cancer, domestic violence, ADD, Alzheimer's, religious tolerance, animal abuse, the victims of 9/11 including the police and firefighters, Crohn's disease and colitis, cystic fibrosis, lupus, leimyosarcoma, and fibromyalgia, infand and childhood stroke, and children left in cars. It turns out that the Association for the Education of Young Children are celebrating young child month. To me it seems as if April almost has as many meanings as the purple ribbon. All the parents from my son's school were given a calendar of activities and a purple ribbon to wear. At the current time there are events in my area going on that are related to: Autism Awareness Month, Month of the Young Child, Earth Day (coming up soon! ), Sexual Assault Awareness Month, Gay and Transgendered Week (ends today), Victims of Crime Week (ends today), Exceptional Child Week (ends today). It is also supposed to be Alcohol Abuse Awareness month, but haven't heard anything about that around here. Anyway, what a busy month!! Left: Park Library on the campus of Central Michigan University. The auditorium, on the main floor, served as the venue for the pending chapter of Central Michigan Autism Society of America's autism "movie night." The auditorium seats about 250 people, has a large screen perfect for movies, a podium and updated sound system. 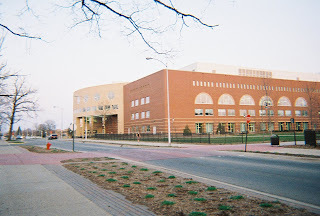 The library is also where my husband, a librarian, works. He is the head of reference and carries out most of his duties on the second floor. Autism Movie Night was held Wednesday, April 16 at 7 p.m. Eleven people watched three 22-minute news features from ABC News. (Perfect evening weather may have kept more than a few people away.) Committee members were Julie Lorenzen, Stephanie Mathson, a reference librarian at Park Library who serves as the library's video bibliographer, and Dr. Patricia Kopetz who oversees the Autism Impairment Certification program at CMU. Attendees included students, parents of children with autism and one special education teacher. Dr. Kopetz introduced the films and led a question and answer session with members of the audience after each feature. The first feature shown was Measuring Success in Treatment. This program highlighted Applied Behavior Analysis, a therapy method which is considered a controversial by some members of the autism community. The news program followed two boys over a several year period. The program demonstrated that the treatment method was fully beneficial to one boy, who was able to successfully be integrated into his school system, and partially beneficial to another boy, who learned more than 100 words and some life skills, but who still needs a lot of support from parents and the staff at his school. The second feature was A Place in the World: Adults with Autism Finding Their Way. The program related the stories of Paul de Savino and Jamie Hoppe, two adults with autism who enjoy the support of their parents, life coaches, and others dedicated to their well-being. Psychologist Peter Gerhardt, Jen Hoppe, cofounder of Quest Autism Foundation, and Paul's mother added narrative to the feature while expressing their concerns about long-term quality of life for people with autism. They also emphasized the need for more funding and initiatives to assist adults on the spectrum. The last feature shown was titled Echoes of Autism. This program featured Paul De Savino, one of the adults who appeared in A Place in the World. At the time he was 36-and amorously drawn to a female acquaintance, who remained anonymous. Interviews with Paul, his mother, and autism expert Dr. Peter Gerhardt helped shed light on the difficulties this individual with faced in terms of love, attachment and heartbreak. An additional segment entitled “My Brother’s Keeper” explored the relationship between two siblings. A young boy discussed his little brother's autism and how the disorder shaped their relationship. He was honest, but loving in what he had to say about his relationship with his brother. A special thanks goes to Dr. Patricia Kopetz, Stephanie Mathson, Randy Claypool, facility manager of Park Library, and Michael Lorenzen, my very helpful and understanding husband. Note: These features were chosen from a list that came with performance rights. College students from the Student Council of Exceptional Children and parents of children with autism indicated which films drew their interest. It is a coincidence that all the features were from ABC (Autism Broadcasting Company? No, actually the letters stand for American Broadcasting Company), which covered all the stories with commendable compassion. All three DVD's will be permanently available for students to check out at the media center in Park library. See complete list of films and see previews of clips available at the Film Media Group's website here. Our committee had two events in two nights. Am feeling a bit exhausted. Today I'll cover the parent panel and tomorrow I'll cover movie night. Our parent panel was held on Tuesday, April 15, 2008. We had two rooms. In one room we had the parents of younger children. In the other room we had three moms who have adolescents. Only four heard the parents of adolescents speak while fifteen or twenty including a student reporter attended the panel of parents with younger children. I was part of the smaller audience where dating, hygiene and social issues were discussed. Social skills are still difficult for people in their teens. I found out that individual sports like track are easier for people with autism than group sports like basketball. Dating also came up. The fifteen-year-old son and seventeen year old daughter of two of the panelists, respectively, are dating. The mothers of the pair have been great friends for seven years. The girl who has a younger brother on the spectrum and who exhibits some signs of Asperger's Syndrome has made up a dating notebook for her boyfriend. "Gifts are sweet, but what I like best is when you tell me you like me for who I am." On Sunday, my nine year old son who is on the spectrum and I participated as a team in a Special Olympics Bowling Tournament in Mt. Pleasant, Michigan. The event was hosted by Chippewa Lanes which is right next to the CMU campus and the Michigan headquarters of Special Olympics. It was a long day but very worthwhile. For several months, my son and I had been going to the bowling alley on Sunday mornings to practice. This was scheduled by Special Olympics and there was no cost to us. We usually got two games in each time we went. We both started weak (neither of us having much bowling experience) but got better quickly. My son was rolling a 10 his first few games but actually managed a 72 at one point. I started in the 40s and can now break a 100. A little practice helps a lot! After the first two games, there was a long wait for lunch. My son did OK with this but grumbled repeatedly how hungry he was. Finally, the pizzas were delivered. The Special Olympians in wheelchairs were served first. After that, the coordinator asked that all the little kids go next. My son (one of the littlest Special Olympians present) jumped up and yelled, "I am a little kid!" He jumped to the front of the line. I love that assertiveness. After finishing the fourth game, we had another long wait for the awards ceremony. I let him play a few video games and he even played his first two pinball games. He was slow on the concept of using the flippers but got it before the second game ended. We will be working some more on this. After I ran out of quarters, we went and waited in the room were the awards were going to be given out. It took a while and my son got bored. Another nine year old boy who my son knows was also in the room. They played some and also grabbed bananas which were left out as snacks. At this fateful moment, someone turned on some music. Both boys ran to the what passed as a dance floor. They began dancing and as they did so they swung the bananas around in the air. It was bananatainment and the crowd loved it. Both boys were hams and they lived it up before they were finally asked by their respective parent to sit down. My son and I took two awards for finishing third and fourth. I honestly am not sure in what. There were a variety of scoring events including team, partner, and individual. This was our first Special Olympic Bowling Tourney and I frankly did not get the rules of the events. There were no handy instructions sheets either. However, everyone seemed to win at least two awards and my son was delighted to go up front and pick up our certificates. I am very pleased at how well my son dealt with the competition. It was a challenge for him and he performed admirably. It was a good father/son day and I am grateful to Special Olympics of Michigan for providing us this opportunity. I am also thankful to Chippewa Lanes. Next up, Special Olympics track and field this week on the campus of CMU. My son is already excited. Five families and at least fifteen college-student volunteers gathered at the Bovee University Center on Central Michigan University's campus for family game night. Volunteers from the Student Council for Exceptional Children (SCEC), the Association for Education of Young Children (AEYC), and the Speech/Communication Disorder program played games with the eight children attending. Some of the volunteers guarded doors to protect potential escapees as child safety is always a concern. Parents had the opportunity to play games such as Fact or Crap or Rummy (a card game) while their children played and had a great time. Games brought for the kids included Candy Land, Electronic Bingo, Uno, and a card match game. Play tents, crayons and puzzles were also on hand. "This is the Play Date Ever!" My favorite books are all upstairs on my nightstand or downstairs in storage. His are the books that dominate the bookshelves in our study. This reveals my hubby's love of history and philosophy. The sentences are from: A New Translation of The Dead Sea Scrolls, translated and commented on by Michael Wise, Martin Abegg Jr., and Edward Cook. 1. They "have not sought Him nor inquired of His statutes" (Zeph. 1:6) so as to discover the hidden laws in which they err to their shame. 2. Even the revealed laws they knowingly transgress, thus stirring God's judgmental wrath and full vengeance: the curses of the Mosaic covenant. 3. He will bring against them weighty judgments, eternal destruction with none spared. Please remember that the above was from my husband's book! We share a study with his books and my papers and scrap booking stuff taking most of the space. I tag Managing Autism, Information Literacy: Land of Confusion, Look Me in The Eye, Translating Autism, and EBD. Honorary tags go to Marla Baltes who I believe has already been tagged for the Book Meme and Mother of Shrek who is going on a blogging hiatus. 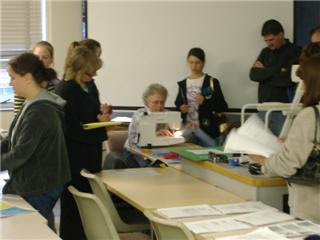 Photo: Central Michigan University students and parents gather around a sewing machine as an occupational therapist closes up cozies filled with rice. The cozies (homemade heating pads) can be heated for 15 to 20 seconds (no more than a minute) in the microwave. Instant rice should not be used. Our event planning team was amazed at the fantastic turnout for Wednesday evening's make it take it night. Five parents and thirty-five college students and a professor made fidgets for busy hands (balloons filled with rice), "lava lamps," (water bottles filled with oil, and colored water), and homemade play dough colored and scented with Kool Aid packets. There were five stations in all with how two posters and an instructor posted at most stations. The Isabella county RESD team (that serves local schools) that planned the activities was composed of two occupational therapists and one physical therapist. How to make a Fidget: Use a funnel or the top of a cut-off water bottle. Insert end of bottle or funnel into balloon (helium balloons work best) and fill with rice. Tie the balloon shut and you have your fidget. Rubber gloves can also be filled to make great fidgets. That's it. It's really easy to make and is great for stressed out parents to use too. Note: I gave my guy with autism a yellow balloon filled with rice when I returned home. The finished fidget was just the right size for his small hand. He held on to it for a long time. I also brought home a light blue cozy that is about six inches long. All my guys liked that! May have to make more. Below is our calendar of Events for Autism Awareness Month. We started planning months ago. Can't believe we're already on our fourth event, which is tonight. We're in the middle of our busiest week! Yesterday the thermostat hit sixty and a bit above for the first time since October. The boys and I returned from a great trip in Ohio around 4 p.m. after about a four-hour car ride. They behaved really well during the ride home, but were more than ready to run and play when we finally pulled in the driveway.. The sun shone and birds sang. The best sound, however, was the voices of six children echoing in and around my backyard. This was the first time since fall that the neighborhood children emerged from their homes to join in for hours of play. My nine-year-old with autism was in the group. He rode his scooter along with the rest of the them and followed in while they created play scenarios. One of my boys brought out a toy pop-up tent that fits about two or three small people inside if they all sit down. Later, I brought out the chameleon tunnel much to their delight. Everyone played outside until about 8 p.m. or so. The tunnel was a gift we received unexpectedly at the autism resource fair on April 2, 2008, I previously wrote about. A Central Michigan Group, Student Council for Exceptional Children (SCEC), donated the toy to my group, Central Michigan ASA (pending chapter) to raffle off. We set it up beside the other four items we had to raffle. Each item had a bag. We sold the tickets for $2 and those that bought a ticket wrote their name and number on it. Then they dropped it in the bag of the item of their choice. At 6:45 we had the drawing. One of the most eager participants was a thirteen year old boy, P.L.. He has a mop of curly dark hair, brown eyes, freckles, a round face and ASD. He is the son of the director of the arts and music camp my nine year old attends and also happens to be one of my guy's best friends. They bonded at the camp and during a bus ride last summer to Lansing's Potter Park zoo. Like my son, P.L. loves frogs. He also loves giving things to people. During the ride P.L. taught my son a song (more about this later) about froggys--a song that became my son's favorite one to sing. The chameleon tunnel resembles a frog quite a bit (with some imagination). P.L.was at the resource fair because his mom is enrolled in a CMU class. He hung out with his counselors who were representing the camp at the resource fair. Well, P.L. decided immediately that he wanted to win the tunnel for my son. He bought two tickets on his own and his counselors helped him buy a few more with the deal that if he won, the tunnel would be brought to the camp in the summer. As raffle chair and potential tunnel guardian, I approved of the deal. P.L. also put a few tickets in for other items as well. I originally told him we'd draw the winners around 6:30, but had to tell him we needed to wait an extra fifteen minutes because attendance to the fair had picked up and I thought we could sell a few more. He was dismayed at the possibility more tickets would be added to the sacks that contained his own, but waited patiently until we drew. I was so proud of him. He asked a couple of times, but wasn't obnoxious about it despite his excitement. We drew at 6:45 and to his delight he won--three prizes! He gave them all away and yes, one was the chameleon tunnel. His mom picked him up from the fair and drove him to my house where he gave the tunnel to his friend much to the delight of both of my boys. I wasn't home when P.L. delivered the tunnel, but my husband told me all about it. Later, I returned home, exhausted but happy. I emailed his mom about how the fair had gone well and how P.L. had made my day. She has a great guy. Note: I was amazed at the circle of giving that occurred. I gave a lot of time and energy to the fair, SCEC gave away the tunnel, P.L. gave away the tunnel to my guy, who knows that it is to be brought to camp in the summer--a camp that P.L. 's mom worked hard to bring into being. Author John Stark Bellamy II has found his niche: murder and disaster in the Cleveland area. The Corpse in the Cellar completes his trilogy on the subject. His other two books are They Died Crawling and The Maniac in the Bushes. Bellamy's most recent work is a compilation of 25 true stories of mayhem. The stories are antiquated-ranging from a 1865 stalking-style murder to 1942 circus fire that killed more than 50 animals. However, the age of the stories does not make them less interesting. Though morbid, each story has the potential to intrigue readers. For example, there's the story about the teenager who killed a neighbor girl in 1889. He hid her body in the cellar of his mother's house, but was given away by the ensuing odor. And then there was the Ashtabula bridge disaster in which more than 80 train passengers died when a poorly designed bridge collapsed in December 1876. The first two or three paragraphs of every story are well written enough to draw a reader in. However, each of the stories (most run ten or more pages) are too long to maintain one's interest. In light of the subject matter, shorter stories would have sufficed. 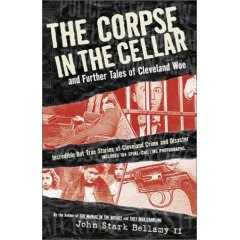 John Stark Bellamy II is a lifelong Clevelander who grew up hearing about Cleveland crimes and disasters from his grandfather, Paul, editor of The Plain Dealer, and his father, Peter, who wrote for The Cleveland News and The Plain Dealer. Also, Bellamy, history specialist for the Cuyahoga County Public Library, has researched his subject extensively and gives slide shows to community members. This is a post by Michael Lorenzen. Julie is down in Ohio without Internet access. However, her recent work at the Autism Spectral Disorder resource fair was noted in the local college paper. The article is by Frank Eslinger and is titled Community members work to raise awareness about Autism. Julie Lorenzen, Mount Pleasant resident and local Autism Society of America pending chapter secretary presented resources from Park Library. "I think the campus library can be intimidating," she said. "We're offering maps and specific resources that Park library has about Autism. It can be helpful to families." Lorenzen said she wanted to stress three important ideas to those that are unaware of autism. "Education, advocacy, and support," she said. The resource fair yesterday went well despite the nervousness I felt yesterday. We had representatives from several organizations such as Special Olympics, our city parks and recreation department, my son's special arts camp, community mental health, a school inclusion group called Everyone Together, and the Autism Society of Michigan. Information from other agencies and therapy providers had been collected and displayed as well. Some of the moms in the autism community came out to support the resource fair planning committee from the pending chapter of Autism Society of America, which hosted this event. Once new family was happy to find us and others were happy to reconnect with the autism community. Hungry Howe's Pizza donated several pizzas and a few boxes of bread, which was nice because the fair ran from 3-7 p.m. I believe the owners have a family member who is on the spectrum. We made sure their delivery man received a nice tip. A reporter from the student newspaper interviewed members of the group and a photographer took a photo of yours truly, so it's possible I may pop up in their Friday edition. The paper is only published on Mondays, Wednesdays and Fridays. My husband may guest post about the article if it's available tomorrow. I'm off to Ohio for two days with the boys today to a place where there is no internet access. It's Spring Break Week for my oldest son and he really wants to visit with his grandpa, grandma, aunts, uncles and cousins. I will be back on Sunday.